If your market is anything like mine, you may have noticed (from the displays of Guinness, cabbage, and “Kiss me I’m Irish” aprons) that Tuesday is the feast of the patron saint of Ireland, Saint Patrick, or as many call it in the U.S., St. Paddy’s Day (quick aside from my dad’s arsenal of bad jokes: What’s Irish and stays out all night? Paddy O’Furniture. HA!). My husband and I both count some Irish heritage in our generally Western European mutt backgrounds, but neither of our families are of the “Boo Ya! We’re Irish!” varieties, despite the fact that both of us have Irish names. And yet we celebrate St. Patrick’s day, without fail, and now you can too. The obvious menu is the one the market sells — Corned Beef, Cabbage, maybe some mashed potatoes. But much as I love corned beef, and I have definite opinions on how to prepare it (crock pot with a bottle of beer, on low for 8-10 hours), and serve it (with Colcannon and hot English mustard), and what to drink with it (I say dark ale, the husband is a Guinness devotee), but I thought I’d present you with something a little different, in case you don’t like corned beef, or don’t eat red meat, or it’s 6 pm on March 17 and you haven’t started cooking, or you’ve already seen sixteen trillion recipes for corned beef all over the blogosphere). And the one that caught my eye (natch) was Dublin Lawyer. 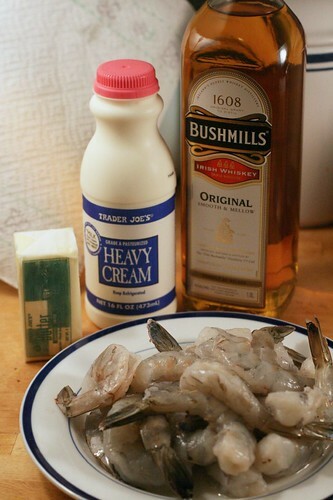 Now Dublin Lawyer is a simple dish – lobster cooked in butter, whiskey and cream (as an aside — whiskey from Ireland or America is always spelled with an “e”. Scotch whisky is “whisky” and don’t let a Scotsman see you spell it like those Irish pansies do). It supposedly got its name because lawyers are both rich and full of booze. Well, I don’t know if you’ve been following the latest news from the legal world, but the rich may no longer apply (the booze probably still does. Have you ever been to a law firm party?) so I set out to ease my pocketbook (and yours) with Dublin Lawyer — recession edition. It really couldn’t be simpler — it has four ingredients and takes about 10 minutes to make and yields an elegant dish with a lovely presentation. In other words, I would eat before you hit the bars for the traditional green beer. Start with a quarter cup of butter, and melt it in a large saucepan until it starts to foam. Add 1 pound of uncooked shrimp. 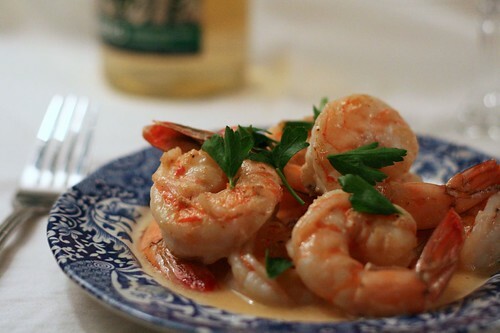 I used frozen here (thawed), and I’d go with at least jumbo, but make sure they’re uncooked (most frozen shrimp are cooked – they’ll get tough if you try to cook them again). 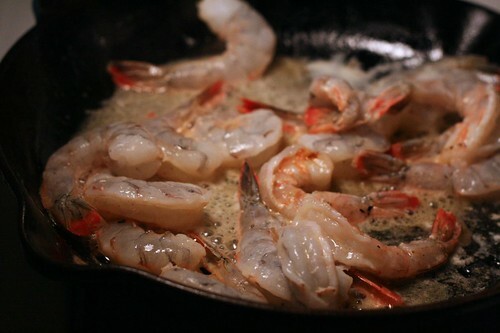 Quickly turn the shrimp in the butter, until they’re just starting to color. Now’s the tricky part. Set 1/3 cup Irish whiskey (most commonly available brands are Jamesons and Bushmills) on fire. (Really, eat before the beer. Or whiskey for that matter.) The easiest way to do this is if you have a gas stove, put the whisky in a metal measuring cup, and heat it over the flame of the stove. Dip the cup into the flame and magically, the whiskey will light on fire. Pour it over the shrimp. (I’m not really sure the point of this step, other than to burn off some of the alcohol, but in the interests of tradition, I have included it. Feel free to skip if you’re so inclined). 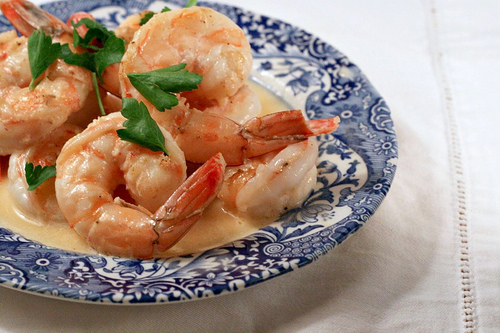 Add 1/3 cup of heavy cream to the pan, stir until the shrimp is all pink and the sauce is combined and then you’re done (I’d recommend against overcooking, as shrimp can get tough quickly). I’d serve this with a green salad and some nice bread to mop up the extra sauce. Or go ahead and make Colcannon if you want to. You know how I feel about cabbage;. I’d shy away from the rich desserts you usually see on St. Patrick’s day and stick with simple — maybe some stewed rhubarb topped with whipped cream. Or you could do what I did, and mix up the leftover whiskey, cream and some sugar to taste, and enjoy a nice tot of homemade Bailey’s. I would say it’s worth celebrating any Irish heritage you may or may not have. Sláinte! 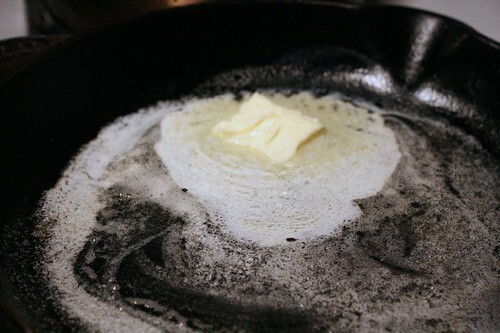 Melt the butter in a large saute pan. 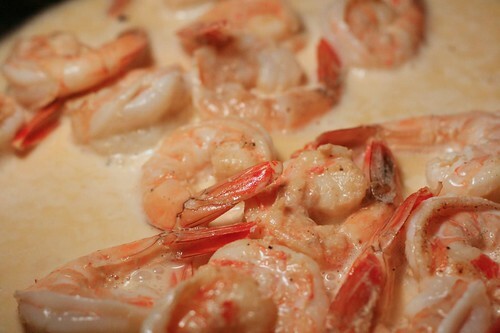 When the butter starts to foam, add the shrimp and quickly turn until the shrimp starts to color. Set the whiskey on fire, add the burning whiskey, then add the cream. Serves 2 hungry people for dinner, or 3 people as part of a larger meal or 4 as an appetizer. Too funny! I have to try anything that is named after lawyers because it’s rich and full of booze! Thanks for sharing the story! Actually I like your alternative for corned beef. It looks great! this looks super good. i would serve it over pasta. but grilled garlic toast sounds even better. I’m confused. I keep looking for the lobster in the recipe. Fair point, but that’s why it’s Dublin lawyer, recession edition. Lawyers can’t afford lobster in these times! Thanks for sharing this on our fb page, great recipe and I am sure one day to make.